Credential Roaming (CR) is especially useful in situations whereby the following 2 conditions exist: (1) user certificate auto-enrollment is enabled; (2) many user tends to logon more than 1 domain machine. You can imagine how many certificates for the same group of users are issued on your CA server if credential roaming were not enabled. No problem for domain logon, as UPN remains the same across multiple user certs. But for applications, such as S/MIME, encryption/decryption using the same cert key becomes a must for roaming users. Do note that only X.509 certificates and private keys are supported and they are stored on the Active Directory certificate store (so beware of potential NTDS bloat but that's another issue). CR is a new alternative to Roaming User Profile (RUP) for storing user certificates and keys. According to Microsoft, CR is also supposed to be a more scalable and secure alternative than RUP. Whenever a user logon and logoff, the local user cert store would always sync with the AD cert store. Hence, the same user would always get the same cert and key regardless of what domain machines he log-on to. Depending on your current AD level, you may or may not need to update the AD schema. For Windows 2003, refer to this guide. For Windows 2008, you can refer to this simpler guide instead. Cisco stackable switch - Catalyst 3750 - allows you to stack different models together. For example, you can stack a 12-port SFP fiber switch (Cisco 3750G-12SD) with a 48-port 1000BaseT (Cisco 3750G-48T) switch. However, if you configure the fiber switch as master, you would see the SDM Mismatch error when you perform a "show switch" command. This is described in this Cisco article. The Catalyst 3750-12S switch supports desktop and aggregator Switch Database Management (SDM)templates. All other Catalyst 3750 switches support only the desktop SDM templates. All stack members use the SDM template configured on the stack master. If the stack master is using an aggregator template, only Catalyst 3750-12S switches can be stack members. All other switches attempting to join this switch stack enter SDM-mismatch mode. These switches can join the stack only when the stack master is running a desktop SDM template. We recommend that your stack master use an aggregator template only if you plan to create a switch stack of Catalyst 3750-12S switches. If you plan to have a switch stack with different Catalyst 3750 switch models, configure the stack master to use one of the desktop templates. Do a "show sdm prefer" to verify and reload. 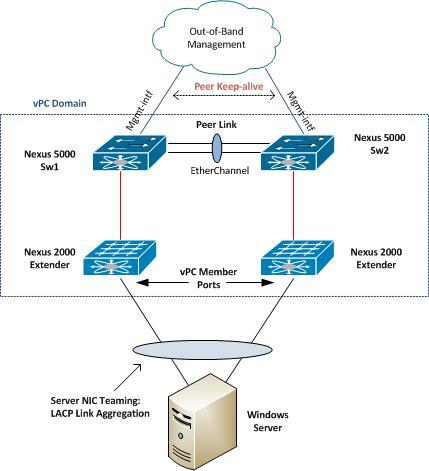 Using NIC Teaming with Link Aggregation mode (such as Intel ANS or Broadcom BACS), a virtual network adapter could be created by joining up the physical dual server NICs and is assigned with a single IP address. Not only the virtual adapter is bundled with double bandwidth (e.g. 2 x 1Gbps), network redundancy can also be achieved as the server is connected to 2 different switch systems. Even if any single switch component were to fail, the server would still remain connected to the corporate network. 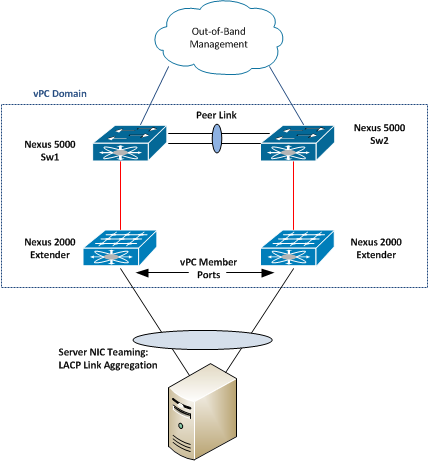 Enable the vPC and LACP features. Create a vPC domain and enter vpc-domain mode. 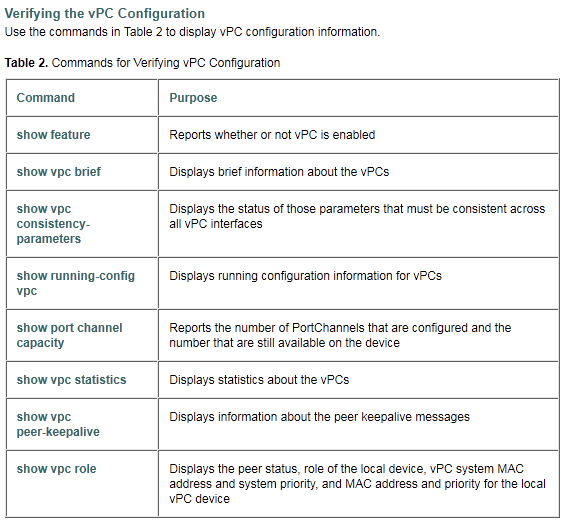 Configure the vPC peer keepalive link across the out-of-band management interfaces. 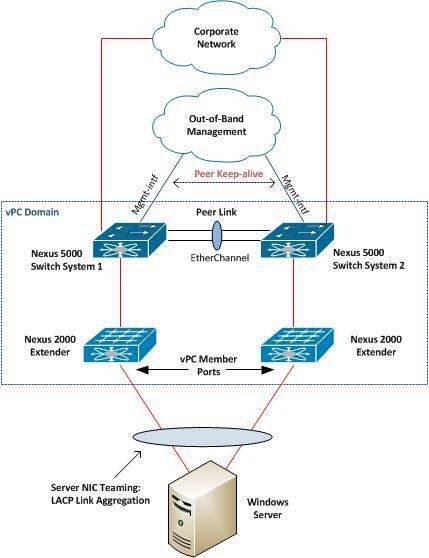 Create the vPC peer link across both Nexus 5000 switch systems through the EtherChannel link. Create new EtherChannel for the server ports and assign it with the same vPC number on both switch systems. If you were using Broadcom BACS, choose "Generic Trunking (FEC/GEC)/802.3ad-Draft Static" mode instead of "Link Aggregation". The former works well with Cisco LACP while the latter may give unpredictable results. Efficient, scalable and reliable file replication protocol which has been tested extensively to ensure data consistency in multi-master replication scenarios. Differential replication of changes to files using the Remote Differential Compression (RDC) algorithm, which enhances efficiency in branch office scenarios. Flexible scheduling and bandwidth throttling mechanisms. Self-heals from USN journal wraps and database corruptions – end user intervention and monitoring requirement is minimal. Provides built in health monitoring tools for ease of monitoring deployments. Improved support for Read Only Domain Controllers. dfsrmig /DeleteRoNtfrsMember: Since Read Only Domain Controllers cannot delete the FRS related global settings from their own Active Directory, this operation needs to be performed by the Primary Domain Controller in its Active Directory. When these changes eventually replicate in to the Read Only Domain Controller (after applicable AD Replication latencies), the DFS Replication service on the RODC is able to proceed with the process of migration. When you run dfsrmig /getGlobalState again, the RODC entry will disappear. Issue repadmin /syncall on PDC emulator to sync with all domain controllers (including RODCs). However, the VRF-Blue (on PE2) won't be able to join the same MDT, as Cisco routers do not support multiple duplicate default MDT across VRFs. However, there is a workaround for this Extranet setup. 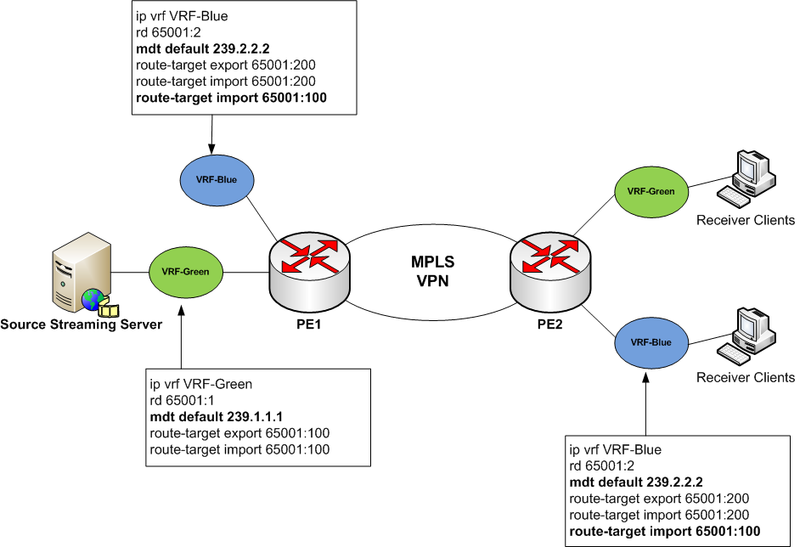 Do note that data flow in MPLS VPN happens in label-exchange. 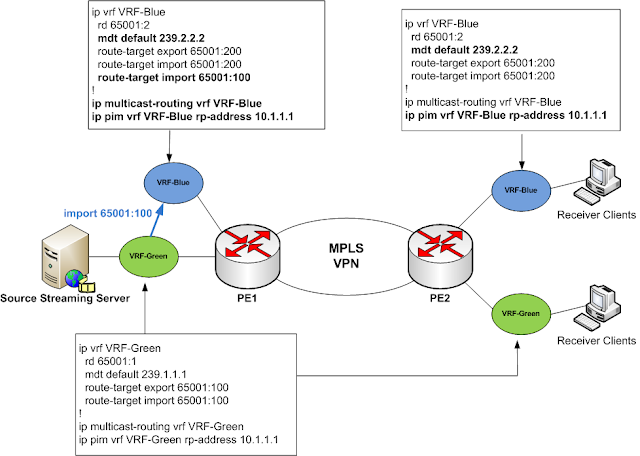 Create another VRF-Green on the source PE1 and import the multicast traffic over to VRF-Blue on PE2. There are 2 options of importing, either import it on the source PE or on the reciever PE. I observed that the latter reciever PE option is more reliable if there are more than 1 reciever PE routers. 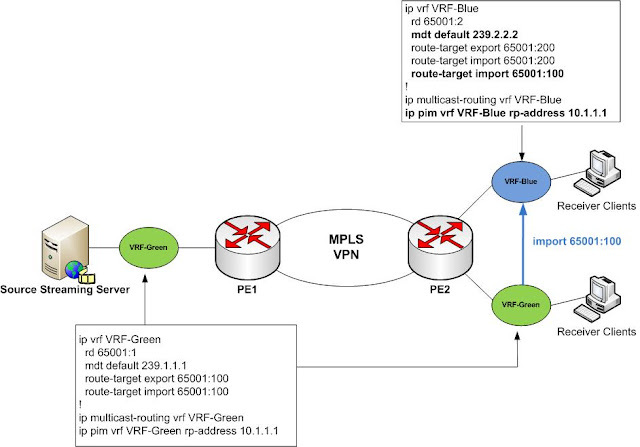 On PE1, add "route-target import 65001:100" on VRF-Blue, enable multicast routing "ip multicast-routing vrf VRF-Blue", and specify the same Rendezvous Point (RP) as VRF-Green for VRF-Blue using "ip pim vrf VRF-Blue rp-address 10.1.1.1". For this setup, assign a new default MDT group for VRF-Blue on both PE routers (239.2.2.2 in this example). 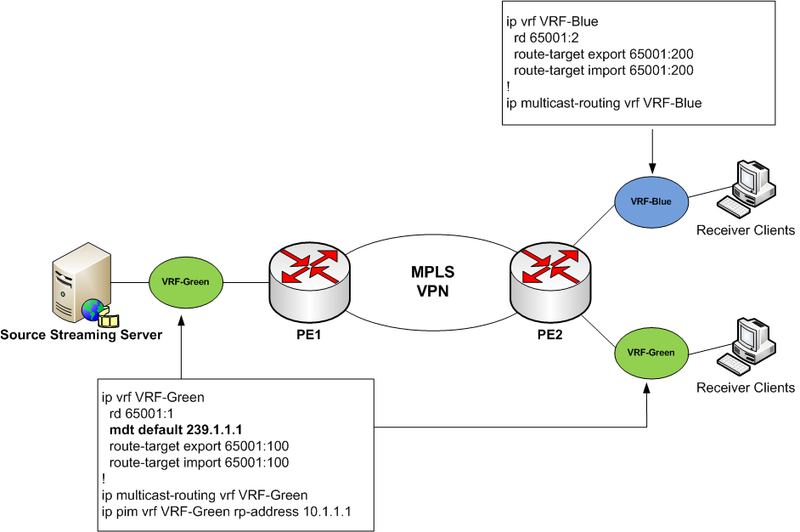 Import the label on VRF-Green over (route-target import 65001:100) as shown in above diagram. In this way, two multicast distribution trees (MDTs) can be created from the same source server. When you perform a "show ip mroute vrf VRF-Green" on PE1, you'll see Extranet receivers in VRF-Blue. Another option is to do the import on the reciever PE (PE 2 in this example). As mentioned earlier, I observed that the stream is slightly more stable if there is more than 1 reciever PE. You'll need to do the import on every reciever PE. 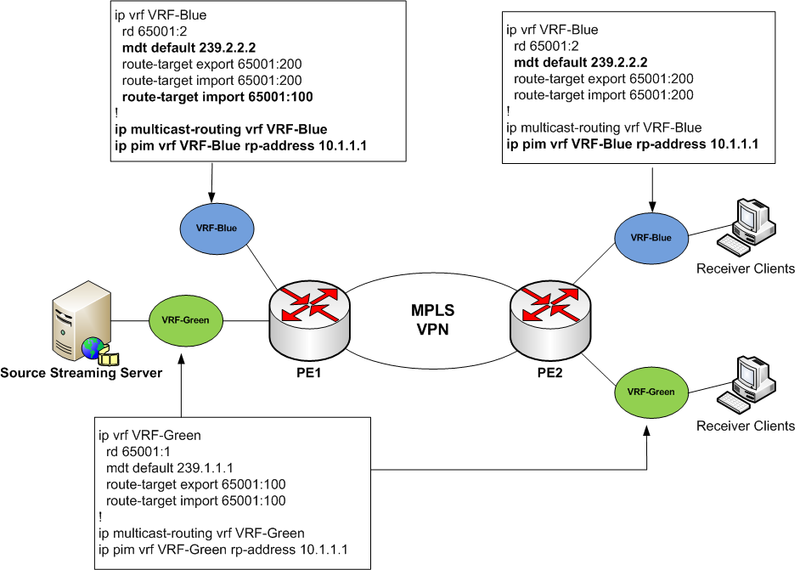 For further details, refer to the Cisco Multicast VPN Extranet support.